Traditional Japanese “Kyusu” Teapot, aubergine, 250ml. The medium-sized handmade clay teapot in faint aubergine color with characteristic side handle and worked-in inner strainer is perfectly suitable for the preparation and enjoyment of Japanese green teas or any other type of tea alone or in small tea groups of up to 3 or 4 persons. Traditional Japanese “Kyusu” Teapot, aubergine, 290ml. The medium-sized, handmade clay teapot in aubergine color with characteristic side handle and worked-in strainer is perfectly suitable for the preparation and enjoyment of Japanese green teas or any other type of tea in groups of up to 4 people. Traditional Japanese “Kyusu” Teapot, beige, 380ml. The larger-sized handmade clay teapot in beige color with ornate engraved pattern, integrated strainer and characteristic side handle is perfectly suitable for the preparation and enjoyment of Japanese green teas or any other type of tea in groups of up to 6 persons. Traditional Japanese “Kyusu” Teapot, black, 120ml. 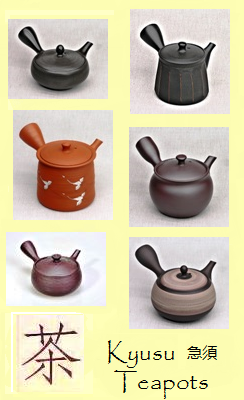 The small, handmade clay teapot in black color with red-brown longitudinal lines, characteristic side handle and worked-in strainer is perfectly suitable for the preparation and enjoyment of Japanese green teas or any other type of tea alone or in pairs. Traditional Japanese “Kyusu” Teapot, black, 220ml. The medium-sized handmade clay teapot in shiny black color with characteristic side handle and worked-in inner strainer is perfectly suitable for the preparation and enjoyment of Japanese green teas or any other type of tea alone or in small tea groups of up to 3 persons. Traditional Japanese “Kyusu” Teapot, black, 360ml. The larger-sized handmade clay teapot in faint shiny black color with characteristic side handle and worked-in inner strainer is perfectly suitable for the preparation and enjoyment of Japanese green teas or any other type of tea in groups of up to 4-5 persons. Traditional Japanese “Kyusu” Teapot, grey-green, 300ml. The medium-sized handmade clay teapot in stylish grey-green structure pattern, integrated strainer and characteristic side handle is perfectly suitable for the preparation and enjoyment of Japanese green teas or any other type of tea in groups of up to 4-6 persons. Traditional Japanese “Kyusu” Teapot, umber, 360ml. The large-sized, handmade clay teapot in stylish umber color pattern with characteristic side handle and integrated strainer is perfectly suitable for the preparation and enjoyment of Japanese green teas or any other type of tea in groups of up to 4-5 people. Traditional Japanese “Kyusu” Sidearm Teapot, green and white, 380ml. The larger-sized handmade clay teapot with green and white ornate structure pattern pattern, integrated strainer and characteristic side handle is perfectly suitable for the preparation and enjoyment of Japanese green teas or any other type of tea in groups of up to 6 persons.